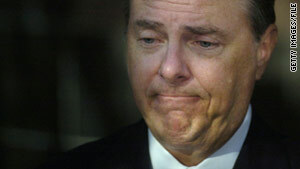 In October 2006, Jeffrey Skilling was convicted of 19 counts of fraud, conspiracy and insider trading. (CNN) -- The lawyer for Enron's jailed ex-CEO Jeffrey Skilling said Thursday he has reached out to the federal Bureau of Prisons to request that his client be allowed to attend his son's funeral. Firefighters found 20-year-old John Taylor Skilling, the youngest of Jeffrey Skilling's three children, dead Tuesday night in his college dorm room, according to California police. On Thursday, Jeffrey Skilling's lawyer, Daniel Petrocelli, added that he's talked with his client, who is "obviously heartbroken and distraught and devastated." Petrocelli said, too, that the family is also awaiting the toxicology study and knows of no signs of foul play in the young man's death. Santa Ana police received a call around 10:30 p.m. Tuesday from two of John Taylor Skilling's classmates at Chapman University, a liberal arts school in Orange County, who were worried that he hadn't shown up for a planned meeting, police Cpl. Anthony Bertagna said. The students, who claimed the younger Skilling was despondent over a recent breakup with his girlfriend, had peeked through the window and seen him on a bed. Members of the Santa Ana Fire Department forced their way into the room, with paramedics soon thereafter determining that John Taylor Skilling was dead, Bertagna said. According to police, there were no signs of trauma and several prescription drug bottles were nearby, as was an ID showing that the young man was from Texas. The coroner has not given an explicit cause of death, pending toxicology results due back in four to six weeks. Bertagna said an ID found at the scene showed that the young man hailed from Texas, the state where Enron grew rapidly and fell just as fast -- in part under the leadership of Jeffrey Skilling. The elder Skilling had been a longtime executive at what became the world's largest wholesaler of gas and electricity, with $27 billion traded in a single quarter at Enron's height. Skilling was named CEO in February 2001, but resigned under pressure six months later as the company began to collapse financially. In October 2006, Jeffrey Skilling was convicted of 19 counts of fraud, conspiracy, and insider trading relating to the collapse of the Texas-based energy services giant. Last June, the U.S. Supreme Court upheld parts of his conviction, but dismissed the conspiracy charges that involved allegations he withheld "his honest services." CNN's Tom Laabs and Stella Chan contributed to this report.